Stepantsminda (Georgian: სტეფანწმინდა; formerly Kazbegi, ყაზბეგი), is a small town in the Mtskheta-Mtianeti region of north-eastern Georgia. Historically and ethnographically, the town is part of the Kvevi province. It is the center of the Kazbegi Municipality Kazbegi. Stepantsminda was named after a Georgian Orthodox monk named Stephan, who constructed a hermitage at this location on what later became the Georgian Military Road.At 5,033 meters (16,512’) above sea level, Kazbegi or “Mkinvartsveri” is the third highest mountain in Georgia. According to the Greek myth, as punishment for teaching mankind knowledge of fire, the Titan Prometheus was chained to a mountainside in the Caucasus for all eternity. According to Georgian versions, it was the icy slopes of Kazbek to which Prometheus was chained. 4000 meters up the side of Kazbek is a cave that is said to have been the prison of Prometheus, known as Amirani in Georgia. Now called Betlemi (Bethlehem), the cave later served as a hermitage for orthodox monks, and was said to contain many sacred relics, including Abraham’s tent and Christ’s manger.Hot springs, acidic and carbonated lakes surround the mountain, and earth tremors are fairly frequent. Covered with 135 square kilometers of glacier, Kazbek is a great place for ice climbing and mountaineering. The Gergeti Trinity Church (Georgian: წმინდა სამება - Tsminda Sameba), built in the 14th century, is the popular name for Holy Trinity Church near the village of Gergeti, just outside Stepantsminda. 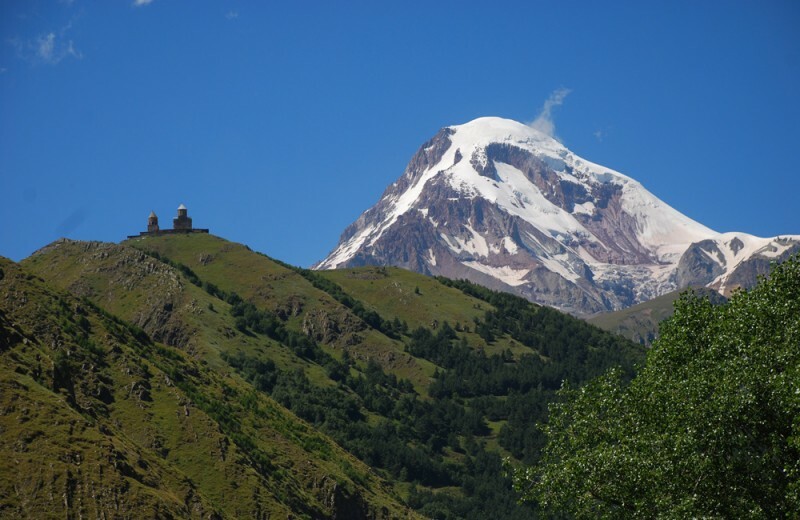 The church is situated on the right bank of the river Chkheri (the left tributary of the river Terek), at an elevation of 2170 meters (7,119’), under the shadow of Mount kazbegi.The Darial Gorge is an almost impossibly steep cleft in the mountains connecting Russia and Georgia. The gorge runs from just north of Stepantsminda for eighteen kilometers until it reaches the Russian border at Zemo Larsi. In places, the cliff faces on either side of the gorge are more than 1000 meters high, and medieval watchtowers, waterfalls and wildlife make this one of the most incredible roads in the world. For millennia, this passage through the mountains has been strategically crucial, and it has been fortified since at least 150 BC. The steep valleys either side of the gorge are great places for bird watching. Eagles, hawks and the massive griffon vulture all nest among the rocky outcrops.